It is Myanmar to some, Burma to others. Officially, it’s the Republic of the Union of Myanmar, but State Counsellor Aung San Suu Kyi has clarified that either is just fine. And there’s no arguing that the country is rich with cultural treasure—something I realized during my December 2015 trip. Burma is like an historical cache, featuring prominently its most defining moments as a nation. As more travelers flood in, they have the opportunity to learn about its history—from 11th-century Buddhism to 21st-century re-opening to the West and including the bumps and obstacles of the country’s once highly optimistic path to democracy. The world continues to watch to see how Suu Kyi addresses not only the Rohingya crisis, but also navigates the muddy waters of tourism growth. After two long-haul flights, a warm tropical welcome at Yangon’s Belmond Governor's Residence, in Myanmar. That funny looking green fruit in the foreground is a custard apple, and was one of my favorites growing up as a child in Manila. It’s not quite ripe; maybe tomorrow. An artful array of tropical juices at the breakfast buffet at the Belmond Governor’s Residence. Orange you thirsty now? Teak chic: Now a boutique hotel, this leafy retreat in the embassy quarter was built in the 1920s as the residence of the Governor of the Kaya state. 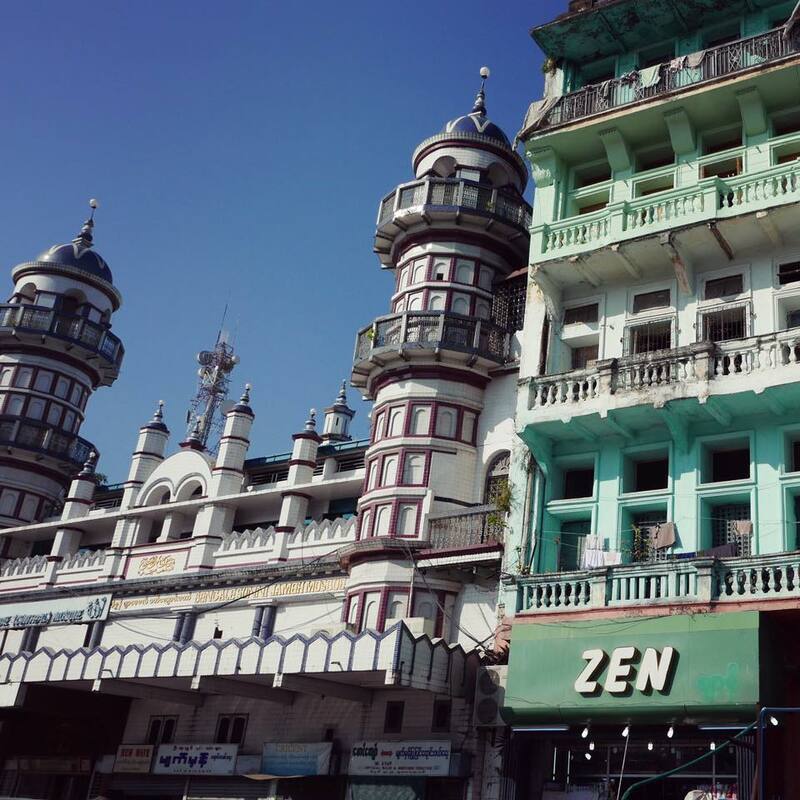 Yangon (the old Rangoon) has an area of 19th-century buildings from the British colonial period that is intact but deteriorating and at risk of demolition. Traffic, modernity, history, and decrepitude. That is the promise and the peril of Yangon today. I haven’t been to Havana, but it seems that country is similarly on the cusp. There’s a new buzz in town: Htet Myet Oo is the face of the new Burma. Owner of the hip Rangoon Tea House, he grew up in England but returned to his native country to start a business. Sidewalk used book sale. Myanmar citizens have a literacy percentage rate in the 90s. Need a copy of Helpful Insects, Spiders, and Pathogens? Or perhaps Frommer’s Guide to Washington, D.C.? It’s here. Many of the 19th-century buildings in Yangon are in a state of disrepair, some taken over by squatters and street-food sellers (pictured). Check out the colorful floor tiles on this building, teak staircases, high ceilings, and the empty elevator shaft. Some, like Thant Myint-U, are trying to save these architectural treasures. The grandson of U Thant, he is the founder of Yangon Heritage Trust. The offices of the Yangon Heritage Trust, dedicated to preserving the cultural treasures of the city and founded by Thant Myint-U, grandson of U Thant, former secretary general of the United Nations. Thanks to pal Natasha Martin, who gave me a fascinating tour of the city today. If you ask her, she’ll tell you why the bottom portions of many walls are painted dark red. This is the entrance to the house of Aung San Suu Kyi, where she spent years under house arrest and where she still lives. Her party won the recent election and the world awaits what is going to happen in the presidential election in March. There is much optimism here. Down the road from here is the American embassy, where the Ambassador, in between visits with Barack and Aung San and sundry mega-watt dignitaries, made time for lil’ ol’ me (it may have helped that I knew him during our salad days). Thanks, Ambassador, and also to Peggy and Robin for connecting me. Beautiful music: Asia’s only surviving harp (I suppose the others are dead and extinct), the saung-gau, or Burmese harp, is an elegant and delicate arched instrument, and plays very pretty music to accompany breakfast. Boy monks with their alms bowls. Many Burmese males will spend a portion of their lives as Buddhist monks. A smaller number of females join the nunhood. Men wear red robes, women pink. Pop Buddha art at the Strand Hotel, Yangon’s most famous hotel. You can buy a small fluorescent blue Buddha at the gift shop for US $50. Found fun gifts for my relatives in Manila at Pomelo, a fair-trade shop on Thein Phi Street, in Yangon, Myanmar. For a few dollars you can take the commuter ferry to Dala township, across the Irrawaddy River from the bustle and buildings of Yangon, hire a trishaw, and take an eye-opening tour of how people live on less (often far less) than $3 a day. This area was also hit hard in a cyclone in 2008. Look closely: this deceptively idyllic scene depicts some tough realities. Dusk falls on Yangon. The Sule Pagoda gleams. A seamstress at Scot Market Yangon. Seller prepares a betel nut chew in Yangon. Many men chew on this all day long, but it does a number on your teeth. Burma’s Shwedagon Pagoda in Yangon is the country’s most sacred Buddhist shrine. It’s an enormous complex full of devotional areas. Cultural influences abound in Burma. Here are three of many in one picture. 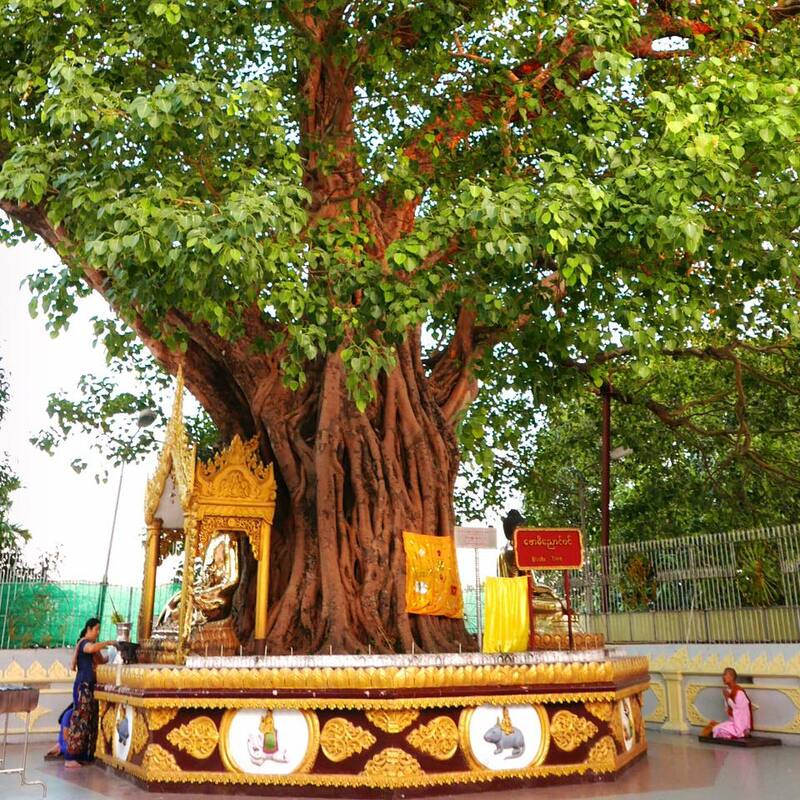 Under the bodhi tree: At one of the entrances to the famous Shwedagon pagoda, there is an enormous tree said to have been grown from a cutting of the original bodhi tree from India under which the Buddha achieved enlightenment. The streets of Rangoon. Myanmar (Burma). Monk meditating on the back side of a colossal reclining Buddha statue. Lots of families, many dressed up for photos, at the Shwedagon Pagoda. The temptations of technology are sometimes hard to resist, even at one of the most sacred Buddhist sites in the world. Shwedagon Pagoda, Burma. To gain merit in the next life, volunteers sweep in organized lines at the Shwedagon Pagoda. Photos © Norie Quintos. Myanmar is more than Yangon. Check out the second part of my trip with Avalon Waterways here.